Decorating for Fall, Thanksgiving and Christmas can be a huge feat, at least here in our house! So, anytime I can find items that can easily be transitioned from one season to the next I love to get them. Think of them as your classic staples in your wardrobe. These are items I don't mind paying a little more for since they can be used in our house for years to come! 1. 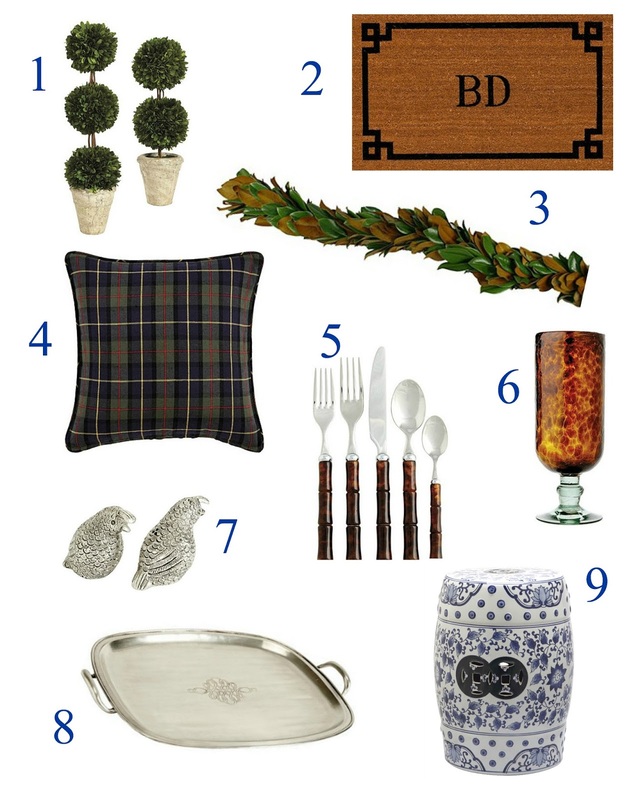 Faux boxwood topiaries- Add a burlap bow for fall, and a tartan bow for Christmas. Ballard Designs has some beautiful ribbon options that match the tartan pillow. 2. Guests are going to be entering your home a lot this season, and first impressions are important. Welcome your guests with this beautiful greek key monogrammed welcome mat. 3. Mantels are the staple of the holiday season. 90% of your family photos from Christmas morning will most likely include your mantel. This magnolia leave garland will add a touch of green and will be subtle but make a huge statement. 4. Create some warmth to your favorite chair, your sofa or your bedroom with these tartan pillows. You can even add a monogram to make it more personal. 5, 6, 7, 8. Impress your Thanksgiving and your Christmas guests with a well set table. These pieces will have your guests talking without overwheling your table. 9. Garden stools are an everyday staple in my opinion. They seem to pull a room together perfectly. Plus, blue and white is a classic color combination that goes well with most decor. What are your favorite items that you like to transition from season to season?